For super-elegant presentation — and the perfect end to a holiday dinner — bake single-serving cheesecakes, and top with fresh raspberries. 43 mins. to 45 mins. To make the crust: Preheat your oven to 425°F. Whisk together the flour, almond flour, sugar, and salt. Cut in the butter with a pastry blender or two knives, or rub together with your fingers until the mixture resembles coarse sand. Sprinkle in a teaspoon or two of water if the dough is too crumbly to hold together when squeezed. Divide the crumbs among the 12 cups of a bite-size cheesecake pan. Press them firmly to the bottoms and about 1/2" up the sides. Bake in the preheated oven for 8 to 10 minutes, until set and just beginning to color. Remove from the oven and let cool. Reduce the oven temperature to 325°F. Bake the cheesecakes for 18 to 20 minutes, until just set. Remove from the oven and let cool for at least 30 minutes — the tops will sink slightly. 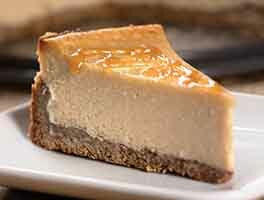 Use a knife to gently loosen the edges, then carefully invert the pan and push the cheesecakes out. Immediately turn the cheesecakes right-side up and chill them. 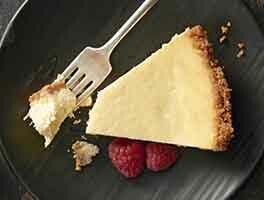 To remove the metal plates before serving, run the blade of a table knife under hot water to warm it, then run the knife between the crust and the metal disk to free up the cheesecake. Just before serving, garnish with fresh berries or pie filling and whipped cream, if desired. I added scharffen berger coco to the crust recipe. It's really good and it holds together well. Doesn't crumble. For the cheesecake, I added 1 tab of freshly ground coffee and Kailua instead of the vanilla. We loved the crust for this recipe! Nice change from a graham cracker crust. I also ended up with far more crust than filling. I make another batch and doubled the crust and tripled the filling - it was perfect. I was making many of these in a deep mini cheesecake pan with wells the size of a regular muffin pan. It took some practice getting the baking time right but they came out gorgeous! Thanks for the recipe. These were a HUGE disappointment! The crust was not tasty at all, which makes me wonder why it didn't just call for a graham cracker crust? Plus the recipe makes way to much crust for batter, so I had empty crusts, and the main flavor of the ones that were filled, was the gross crust! The filling was OK, nothing special about it, but that dang crust is just so overpowering. We ate two and just threw the rest out. I really don't understand the rave reviews. What a waste of amazing cream cheese. I used a regular muffin tin without paper liners so as to get a smooth side. With a baking spray, they came right out after being chilled. They didn't look as nice as pictured, but still looked very good. Tasted excellent! I cooked the cheesecakes for 18 minutes with a pyrex dish under it filled with hot water. Had no issue with cracks or sinking middles. These received RAVE reviews from all who tried them! I purchased the mini cheesecake pan from KAF (also wonderful!) and decided to give their recipe a try. Everyone said the crust was a great complement to the filling and they aren't too sweet. One taster even said they're "perfect"! I did add a blueberry swirl to each - just cooked some blueberries with sugar and a bit of cornstarch, then strained through a fine mesh sieve. Placed a dollop on each, then swirled. They didn't need anything more. I will definitely be making these again with different swirls/add-ins. Thanks for yet another winner, KAF! I made this recipe yesterday and the family loved it!!! I followed the recipe using sour cream instead of cream and with an Oreo crust (12 cookies crushed mixed with 2 tbsp of melted butter). I baked it for exactly 18 minutes. I let it cool to room temperature for a half hour and then refrigerated it for 2 hours before serving. I didn't bother running a knife around the edges, I had my son hold the inverted pan while I gently pushed each through catching it as it came out. They were picture perfect! I will definitely make again! I have made these little cheesecakes twice and they turned out well each time. The first time I followed the recipe exactly using the cream. The crust was very good and I liked that it had a almond flavor and was different from the usual graham cracker crust. 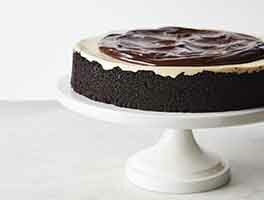 The second time I made them I was having a Fall party and substituted a gingersnap crust and used sour cream. That was good too. In both cases the filling was smooth and so easy to prepare. Having tried both the cream and the sour cream versions, I prefer the cream and will use that in the future. I used the mini cheesecake pan from KAF and 18 mins was perfect baking time for me. They really are very pretty on a dessert tray and people love their little size. 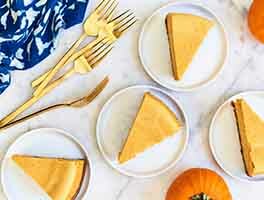 I made this recipe with a standard graham cracker crust instead of the almond flour crust called for in the recipe, and after chilling the cooked cheesecakes they oozed a considerable amount of melted butter, making them inedible. The filling looked great and baked up nicely - what did I do wrong with the crust? 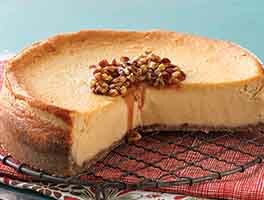 Given that I didn't follow the recipe as written I will recommend it- but would love to know how to prepare a standard graham cracker crusted cheesecake in the mini cheesecake pan!